At one time in our old Kerrisdale garden we had plant labels for all our plants. This meant that if I did not consider my Rosemary’s many perennials I had 600-plu labels for my hostas and 85 for my roses. Since our move and even before our move labels were lost and now we have quite a few mystery plants in our Kitsilano garden. 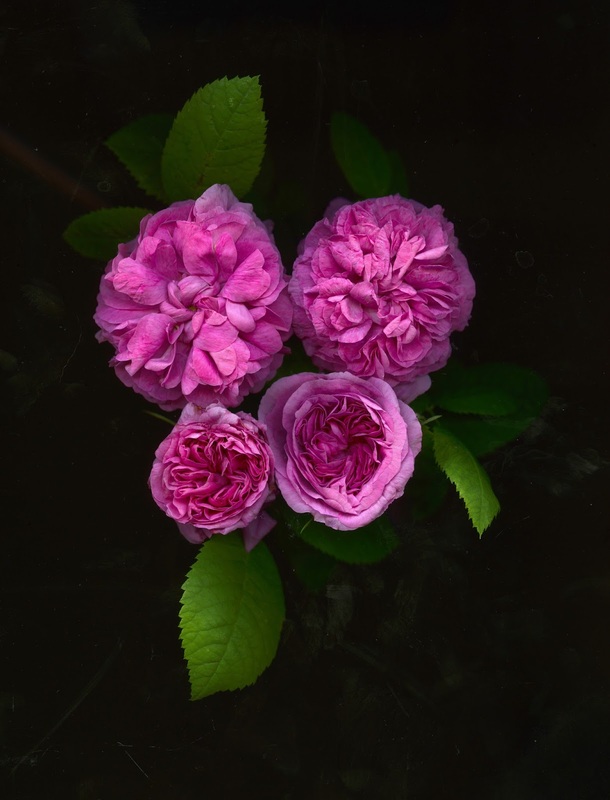 One of them is a rose which I am sure is the Centifolia/hybrid perpetual (they cannot make up their mind on this one) Rosa ‘Duchesse de Rohan’. It bloomed a bit later than all my Gallicas and the only way I will eventually be able to identify it will happen if it re-blooms. Hybrid Perpetuals ( an inaccurate misnomer) do bloom more than once. So if in the fall it blooms she will be the Duchesse. For those who might want to explore who she was here is the Wikipedia citation. Link to: Is She The Duchesse? Velamen in Spanish is poetically a covering. But it is also the group of sails on a ship. 1. m. Conjunto de velas (‖ unión de paños para recibir el viento en una nave). July in Vancouver and more so August are the luxurious months when sometimes one can sleep on one’s bed over the sheets. If it might cool off early morning covering oneself with the top sheet will be enough. To me these are the months that bring back memories of visiting my mother in Veracruz with my Rosemary. We were sure to oil well the hinges of the doors of our separate rooms (only in the beginning!) so that my mother would not hear our escapades in the middle of those sultry nights in that Mexican Gulf port. Those memories are reinforced with others around one photograph (and a few others) by J. Frederick Smith that features a woman in bed with a tray on the floor with coffee and bread – breakfast after a night perhaps in a Paris hotel. Where is the man? Is he in the bathroom? Perhaps he is the one who has taken the picture. Nobody to my mind has written better about such a scene (complete with a beautiful woman and cigarettes, the latter once seen as a necessary romantic item) than Argentine writer Julio Cortázar. Unlike my other hero, Jorge Luís Borges, he never had any problems with women. As I looked at these photographs of the amazingly sensual Ona Grauer on my psychiatric couch (a sheet on it) in my studio I immediately thought of Cortázar’s story Tu más profunda piel. Alas! I checked my Blogger blog’s search engine and I featured that story twice before, here and here! Most who look at Grauer’s photographs will not mind. The bad news is that there is not translation to the story. You will have to use your imagination. In Spanish the word for sheet is more musical. Del lat. sabăna, pl. n. de sabănum. 1. f. Cada una de las dos piezas de lienzo, algodón u otro tejido, de tamaño suficiente para cubrir la cama y colocar el cuerpo entre ambas.